Today I had a bilateral meeting with State Secretary Rex Tillerson at the US State Department, and then we both had a meeting with President Trump. We focused on our interaction in the international arena. It was confirmed that, despite all the known difficulties, our countries can and should join efforts to address key issues of the international agenda. We spoke in detail about Syria, including in the context of the recently formulated ideas about creating de-escalation zones. We share an understanding that they should represent a step towards ending the violence throughout Syria which will help us resolve humanitarian issues and create a solid foundation for moving towards a political settlement based on UN Security Council Resolution 2254. We agreed to continue to work together within the Astana format, where the United States is an observer. We highly value the constructive input of the United States during the recent meeting. We will also cooperate within the Geneva process, which, according to Special Representative of the UN Secretary-General Staffan de Mistura, should resume as early as next week. We look forward to the Syrian government and all the opposition groups acting in a constructive manner. We also covered other issues that the international community is facing, where, together with the United States and other actors, we can play a positive role. In this context, we mentioned the Palestinian-Israeli settlement, the situation in Afghanistan, and the implementation of the Minsk Agreements regarding the Ukrainian settlement. We agreed to maintain working contacts on these issues, and to seek ways to narrow the gaps between the positions of all stakeholders. We discussed the state of our bilateral relations, which is not encouraging. We are well aware why relations are where they are now. Unfortunately, previous US administration did everything to undermine the foundations of our relations. Now, we have to work almost from the ground up. We perfectly understand that Russian and US citizens want to live in peace and be able to interact normally. I think that the politicians should make sure that all artificial obstacles that lie in our way should be removed. Secretary of State Tillerson and I discussed the outcome of the meeting of our deputies, who reviewed the state of our bilateral relations in New York the day before yesterday. Clearly, they did not resolve all the problems. I would even say that the progress is fairly modest. We agreed that we will continue to use this channel to consider the artificial irritants in our relations. I believe this is a constructive and business-like approach. We will not be able to resolve all the problems in one sitting. This is absolutely clear. But the fact that there is a desire to move in this direction is a positive sign. President Trump clearly confirmed his interest in building mutually beneficial, business-like and pragmatic relations, as well as to resolve the problems at hand. It is important that President Putin and President Trump are focused on achieving concrete results which will be tangible and allow us to overcome problems, including on the international agenda. Question: Was the issue of sanctions discussed, in particular, restoring access to the Russian state property in Washington DC and New York? What will the response be if the situation remains unresolved by the US side? Sergey Lavrov: Sanctions are a unilateral action against us, and so resolving that is not our problem. The issue of state property holds a special place in our talks. Property rights are affirmed by legal documents issued in the USA. The Obama Administration in its last days in power resorted to petty actions against both our property and our diplomats who were ordered to leave the United States within twenty-four hours. Everyone, in particular the Trump Administration, is aware that those actions were illegal. When those decisions were announced, the President of the Russian Federation Vladimir Putin said that we are completely entitled to respond reciprocally. The US side knows what that would look like. Yet we are not going to follow those who are trying to destroy our relations. Our US colleagues know about our stance. I hope we will be able to resolve the situation without our relations deteriorating. Question: When discussing Syria, did you speak about a political settlement in that country? Which role do you think Bashar al-Assad will play? How does your point of view differ from the US? What progress have you achieved on that after a month of discussion? There is a lot of focus in the United States on US President Donald Trump’s possible contacts with Russian representatives during his election campaign, there was some misunderstanding. Are there any changes in bilateral relations? Sergey Lavrov: Regarding the talk and clamour around our relations, fictional narratives about us allegedly controlling their domestic politics. Of course, we notice the absolutely abnormal background against which relations are developing. I think it is demeaning for the American people to hear that the Russian Federation controls domestic politics in the USA. I believe that politicians severely damage the US political system when they try to act like America is being governed externally. As to Syria, we first of all focused on the ideas that had been discussed during Secretary of State Rex Tillerson’s visit to Moscow when he shared his thoughts regarding de-escalation and safety. This was the initiative US President Donald Trump mentioned during his telephone conversations with Russian President Vladimir Putin. Secretary of State Tillerson later presented it in more detail in Moscow. The initiative is now being materialised in agreements concluded in Astana, where four de-escalation zones were proposed, including in the south, since the USA is particularly interested in stabilising the situation on Syria’s borders with Jordan and Israel. We are ready to cooperate on the issue. Today, we discussed particular means and mechanisms that we could manage together. Apparently, the political process is quite important. We are confident that we cannot put things on hold for long. For that reason we welcome the decision by the United Nations Special Envoy for Syria, Mr Staffan de Mistura, to resume the Geneva talks in mid May, in a few days. As I have already mentioned, we expect that the framework in which the process is developing will be acceptable for the Syrian Government and all the opposition groups, and that the talks will engage all four “baskets” outlined by Mr de Mistura: governing the country, preparing a new constitution, preparing new elections and fighting terrorism. Question: The recent Pentagon statement about “the devil being in the details” regarding the creation of de-escalation zones is not entirely clear on the part of the US. Who will ensure safety in those areas and how will the project work overall? Do you think the United States is doing enough on this? Sergey Lavrov: The fact that “the devil is always in the details” is a truth that everyone recognises. At the current stage there is agreement both conceptually and with respect to the geographical parameters of de-escalation zones. The Memorandum signed in Astana has proscribed further steps as to how the stakeholders will ensure safety belts around the de-escalation zones. It is in our interest for the US to actively engage on these issues. We think that is also in the US interest, at least concerning the southern de-escalation zone. We proceed from the assumption that they will play an initiating role in this process. We hope that the US will be able to make its contribution to security and humanitarian issues, to supporting the ceasefire regime in other territories where problems remain. Question: Much has happened in international relations since Donald Trump’s inauguration. Can you say that the way the US and Russia speak to each other has changed, especially after a missile strike on Syria? 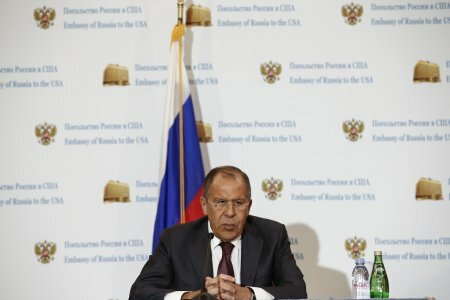 Sergey Lavrov: The dialogue between Russia and the US is now free from the ideology that characterised it under the Barack Obama Administration. US President Donald Trump, his Administration, and Secretary of State Rex Tillerson are the kind of people who want to maintain a dialogue not as a means of demonstrating what they can achieve in the area of ideological preferences, but rather as a means of solving particular issues which have great bearing on the nation’s progress, peoples’ well-being and settling conflicts in different areas. Question: Did US President Donald Trump during your meeting raise the issue of US concerns over Russia’s interference in the US election? Sergey Lavrov: I have already answered this question. We are watching what is going on here in relation to Russia and its allegedly “decisive role” in your domestic politics. I spoke about concrete things with Donald Trump. None of us touched on that bacchanalia. Question: US intelligence agencies accuse Russia of interfering in the election. US President Donald Trump says it is not true. Did he give you any assurances that he does not believe Russia somehow interfered in the election campaign? Sergey Lavrov: I thought we were all grow-ups here. I never thought I would have to answer such questions, especially in the US, with your deeply rooted democratic political system. President Trump said publicly a number of times what he thought about the allegations that we supposedly interfered in your domestic affairs. His public statements are sufficient for me. There is no need to tell us about this in private, secretly. We know Donald Trump’s position and that of those who try to prove otherwise. The problem is that nobody has ever uncovered a single fact, a single shred of evidence. And if you cover international affairs and life in your country, try to find out, as journalists, where those facts are. Question: You have just learnt that FBI director James Comey was fired. Considering the accusations made by the FBI against your country, were you happy to hear that news? Sergey Lavrov: I’m not the one you should be asking. I can give you examples of people being hired and fired in Russia, France, Great Britain. These are internal matters for you. Question: Did you discuss a possible meeting between President Vladimir Putin and President Donald Trump? When can it be held, in July or earlier? Sergey Lavrov: The presidents reaffirmed during their recent telephone conversation that they would meet on the sidelines of the G20 meeting in Germany in the first 10 days of July. During my meeting with US Secretary of State Rex Tillerson today, we discussed what we can do to make progress on the issues I have mentioned, including Syria, so that practical results would be achieved at this meeting. At any rate, the presidents will meet in July. Question: Can you tell us more about your meeting with US President Donald Trump and your relationship with him? How can the fact that President Trump is a businessman help Russia have a better relationship with him than it had with the Obama administration? Has he made any promises on this score? Sergey Lavrov: I have already answered this question. It is always better for relations when people do business rather than try to promote their ideological preferences or engage in propaganda. This forms the basis for our expectations. Question: What is Russia’s exit strategy in Syria? Sergey Lavrov: We don’t have an exit strategy. All of us must fulfil our agreements, as UN Security Council resolutions say. Agreements must be honoured and terrorism must be rooted out in Syria, which must not become a seat of extremism and instability as it happened in Iraq and Libya. Someone asked me about Syrian President Bashar al-Assad. In Iraq and Libya, the international community did its utmost to overthrow Saddam Hussein and Muammar Gaddafi. We can see what this has resulted in. As regards the settlement of the Syrian crisis, let us draw conclusions from our past mistakes and opt not for replacing the leader but for rooting out the evil of terrorism. President Donald Trump has reaffirmed today that the main goal for the United States in Syria is to defeat terrorism. We fully agree on this. Question: What can you say about the allegation that Russia is supporting the Taliban in Afghanistan? Sergey Lavrov: We have asked for evidence of this more than once. Those who study Afghanistan have a full view of the developments there. No serious analyst will try to score points by claiming that Russia is supplying weapons to the Taliban. We do work with the Taliban in order to implement the UN Security Council decision proposed by the Afghan government, according to which the Taliban will be made part of the political process if they recognise the current constitution of Afghanistan, renounce violence and sever all ties with terrorists. This is the only basis for working with the Taliban. The Afghan government is willing to come to an agreement with them on this basis. The Taliban are part of the Afghan people. It is difficult to imagine that the conflict can be settled without them, especially considering the devastation left there by the 10-year-long deployment of the NATO forces, which have not resolved a single problem but have only aggravated the terrorist threat by failing to prevent ISIS from entering Afghanistan, where ISIS did not operate before, and the more than tenfold increase in drug production. There are many problems. All Afghans must be united on the basis of the conditions I have mentioned. Question: Is it true that during your meeting President Trump did not mention Russia’s alleged interference in US elections last year? Did you discuss this issue at all? Sergey Lavrov: I have just answered this question. US President Donald Trump has said in public that this is not true. Give us at least one fact, and we will be able to react. We are told openly that everyone knows everything. This has been going on for months yet not a single fact has been provided, including in the Senate, which has created special commissions to deal with this issue. That’s not serious. Question: You have mentioned Russia’s interest in US involvement in the creation of de-escalation zones in Syria. Can you provide more details on this? Did President Trump or Secretary Tillerson say that the United States would cooperate with Russia, one way or another, to create these zones? Sergey Lavrov: To begin with, the idea was initiated by US officials – President Donald Trump and Secretary of State Rex Tillerson. We used the Astana venue to promote its practical implementation. We will welcome any US contribution. This issue must be entrusted to those who are dealing with the situation on the ground professionally, and who have the information. We can facilitate this process both in Astana and in Geneva. We have reached an agreement that we, as active participants in the common efforts towards a Syrian settlement, should maintain these contacts with the other key players, primarily regional countries. Thank you. We must leave for Alaska now. 651: 30 seconds to mars. Foreign Minister Sergey Lavrov’s remarks and answers to media questions following talks with US Secretary of State Rex Tillerson, Washington DC, May 10, 201711 May 2017: Foreign Minister Sergey Lavrov’s remarks and answers to media questions following talks with US Secretary of State Rex Tillerson, Washington DC, May 10, 2017! лучшие комедии. Foreign Minister Sergey Lavrov’s remarks and answers to media questions following talks with US Secretary of State Rex Tillerson, Washington DC, May 10, 2017.